In our previous discussions we came across, Serialization, serialVersionUID and transient variable. 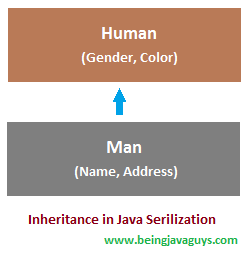 In this particular blog we will see ?Inheritance in Serialization?. In case of inheritance, when we want to serialize an object there may be three possible scenarios. In case super class is Serializable than all its subclasses will be serializable by default. No need to implement serializable interface in subclass explicitly. See the implementation below. In case super class is not Serializable than to serialize the subclass?s object we must implement serializable interface in subclass explicitly. In this case the superclass must have a no-argument constructor in it. See the implementation below. If superclass is not Serializable then all values of the instance variables inherited from super class will be initialized by calling constructor of Non-Serializable Super class during deserialization process. As we can see in the output figure above ?Gender? gets a default value and ?Color? is getting null because of no default value set. (3) If the superclass is serializable but we don?t want the subclass to be serialized. To prevent subclass from being serialized we must implement writeObject() and readObject() method and need to throw NotSerializableException from these methods. Here we are done with 'Inheritance in Java Serialization'. In our upcoming blogs we will see more about Java Programming and other opensource technologies.